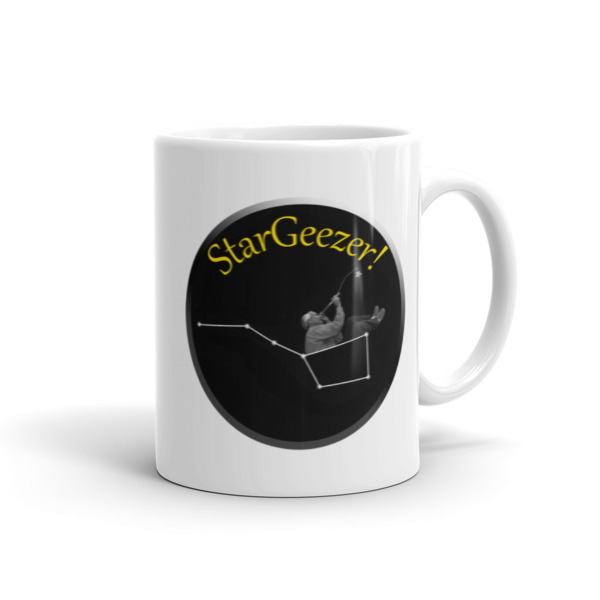 StarGeezerStuff: Unique, fun T-shirts, cups, posters, pillows, bags, etc. 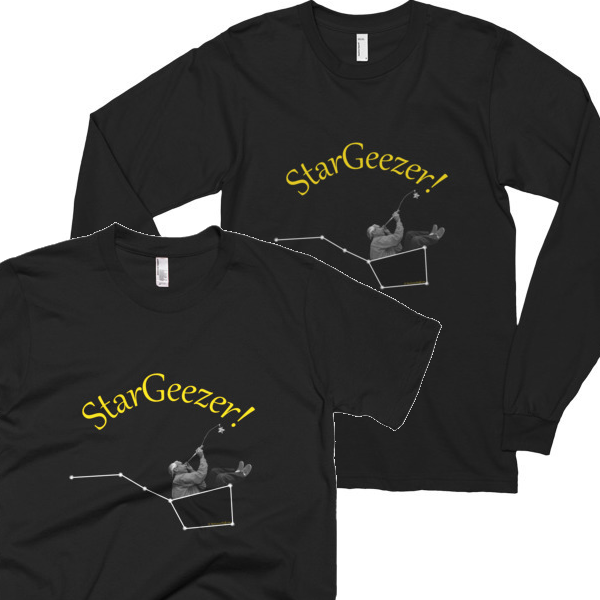 Geezer:  An odd or eccentric (perhaps cranky) man. 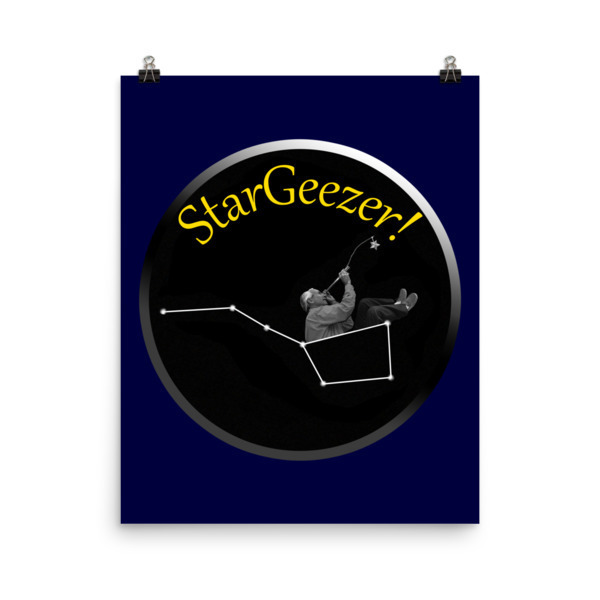 StarGeezer: An odd or eccentric (cranky if it's cloudy) man with a telescope. 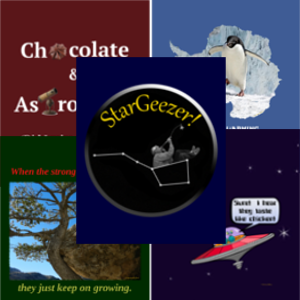 Here at StarGeezerStuff.com you will find some unusual items for yourself, for gifts, for fun, with Free Standard Shipping in the USA on all items! We have over 200 T-shirts, coffee cups, pillows, posters, sweatshirts, and hoodies, in various styles and colors, all with our own, unique messages and designs on them. 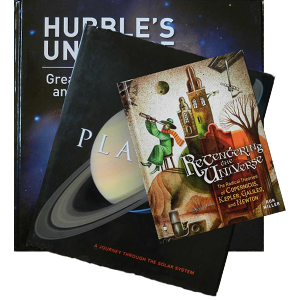 Many of the items will have an astronomy, science, or inspirational theme, some whimsical, some crazy, some more serious. We will be adding new designs, and new products, frequently, so please check in with us on a regular basis! For each item you'll see a brief description of our unique design, along with specifications about the product. We've tried to keep our prices competitive, while offering a high-quality product that we ourselves would not hesitate to use or wear. Products "Made in USA" are labeled as such in the description and are generally a bit costlier and better quality. 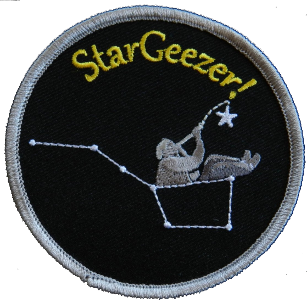 Are you a StarGeezer too, or do you know somebody who is? Show it with this fun, fully-embroidered 3-inch iron-on patch (could be sewn on too). Suitable for caps, pockets, shoulders, and more. We offer free standard shipping in the USA, and some items can be bundled into one shipment when ordered simultaneously. If you are not pleased with the item, or it is defective, you can request either an equivalent replacement or refund. We would love to hear from you with any suggestions for new products, requests for alternate colors, or comments on the items we're offering. 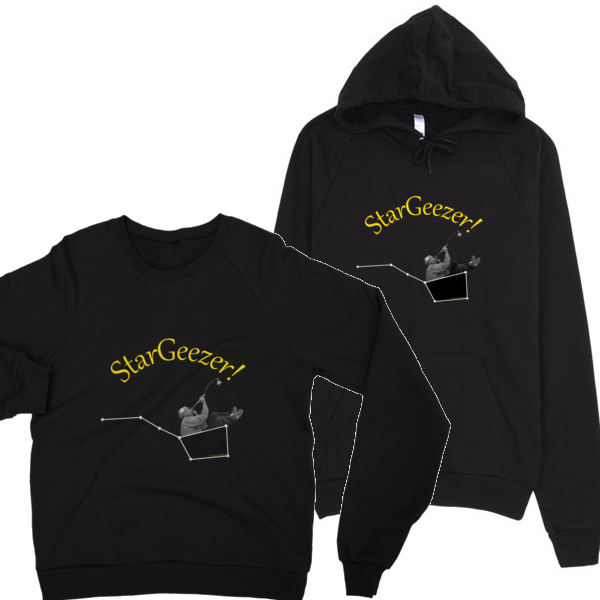 Thank you for shopping at StarGeezerStuff.com! 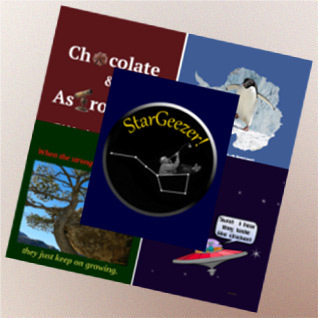 StarGeezerStuff was started in 2016 by John and Laura Verderame as a creative outlet and just for fun. 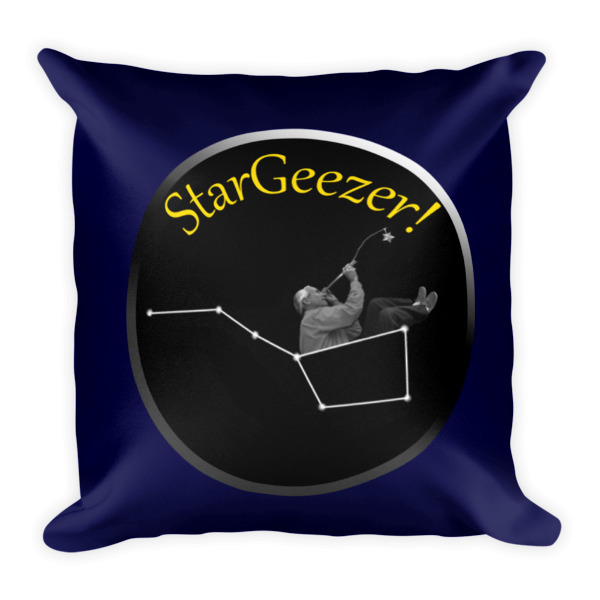 John, of course, is the "stargeezer" of the pair, an avid amateur astronomer for over 55 years. 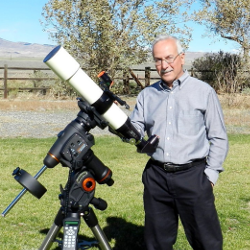 He owns an array of telescopes, and rarely misses being outside on a clear night. Laura also enjoys observing the heavens, assisting John particularly with the computer end of astrophotography. For StarGeezerStuff, John usually is the idea guy, then we both tweak the design, and finally Laura does the computer magic to get everything just right. 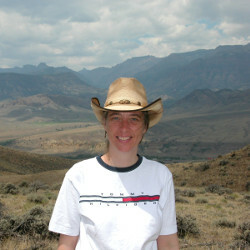 Both of us have traveled extensively, and also love book collecting and other hobbies. May you still have fun!" © 2017 StarGeezerStuff.com. Design: HTML5 UP.